How cute is this Play-Doh Disney Princess Play Set (on sale) on Amazon? Hurry and get the Play-Doh Disney Princess Undersea Wedding with Ariel today for $16.99 NOW only $6.99 from Amazon! Save BIG! (Limit 3.) Check out all of the Amazon deals here! Splash into Play-Doh creativity and re-create magical moments from Disney’s The Little Mermaid movie! Ariel and Prince Eric are about to get married and everyone’s invited to join the celebration. The unique castle piece features both King Trident and Eric’s castle on the outside, and on the inside is a mold to create Ariel’s wedding gown. Simply place Ariel and some Play-Doh compound in the mold, close it, then open it again to reveal a gorgeous gown. Decorate with the molds and accessories, and even create Prince Eric with the stamper. Sebastian and Flounder are ready to join the fun reimagined as Play-Doh tools, and the can of Play-Doh Sparkle compound helps creations shimmer and shine. When the fun is done for the day, store everything on the coral reef base! Ages 3 years and up. Copyright Disney. Hasbro, Play-Doh and all related terms are trademarks of Hasbro. 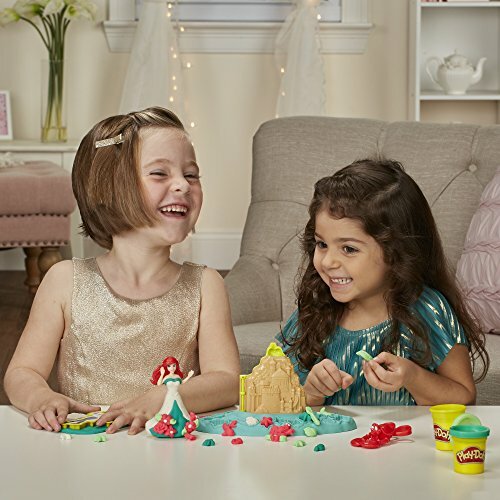 Buy the Play-Doh Disney Princess Undersea Wedding with Ariel from Amazon.